With all these crazy snow storms we have been having lately, I have been trying to stay prepared in case we lose power. With several feet of snow on the ground, high winds, and slippery roads, I am surprised that we haven't lost it yet! (Knock on wood.) There was one big storm that they predicated to be huge and to be prepared for major power outages. (You know how they like to get excited about storms.) So, I spent the day before the storm running around, doing everything that required power. Laundry, dishes, vacuuming, cooking, drawing off water, you name it! I made a big pot of soup that could be put on the stove to warm up if there wasn't power. I also prepared this pasta salad to have ready in the fridge, if needed. Well, we never lost power. It may have flickered a few times, but nothing came of it. I am not disappointed though! It's nice to lose power for a little time, but not for days. I like running water and refrigeration too much! I was more pleased about having lots of fresh, powdery snow to play in! Even though we didn't lose power, we still got to enjoy this pasta salad. 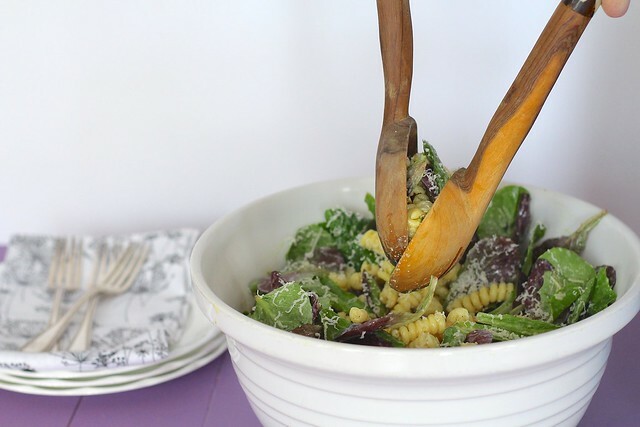 Caesar salad with pasta? Brilliant! This was a fabulous, light dinner. And it made an excellent lunch the next day. This would be a great dish to serve at a cookout (wait, what are those again?) in the summer. 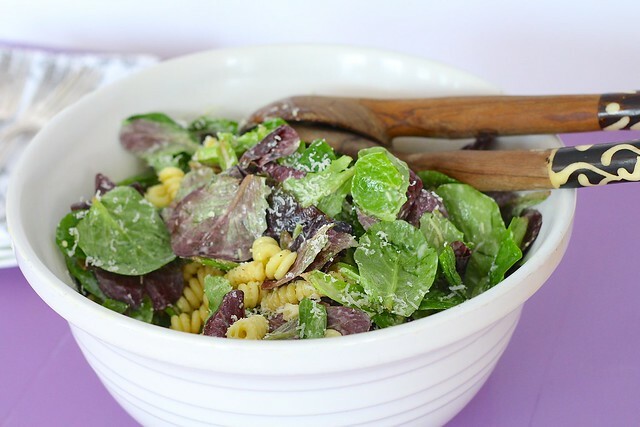 Or to mix up your typical caesar salad. Either way, you'll love it! For the dressing, pulse the garlic in a food processor until minced. Add the buttermilk, lemon juice, mayonnaise, mustard, Worcestershire, salt, and pepper and blend until smooth. With the motor running, add the oil until incorporated. Add the parmesan cheese and pulse until mostly smooth. Store in an air-tight container in the fridge. 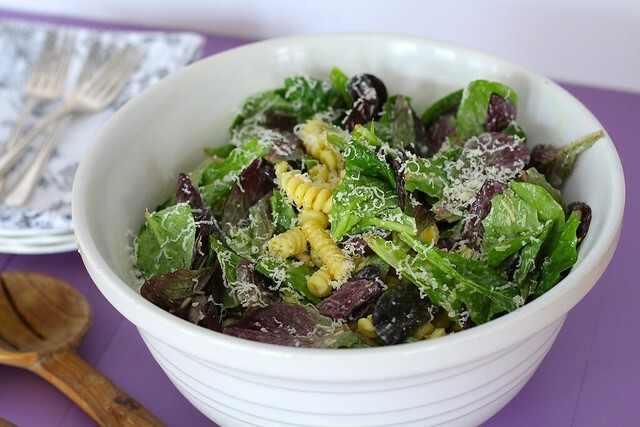 In a large bowl, toss the cooked and cooled pasta and the romaine together until combined. 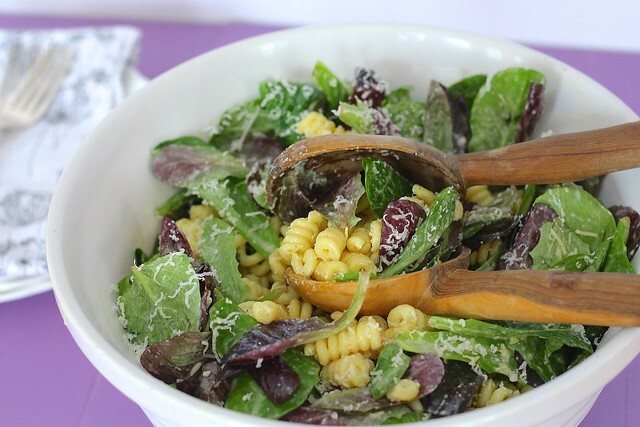 Pour the dressing over the salad, add the Parmesan and toss to combine. Season with salt and pepper to taste. Serve cold or at room temperature.